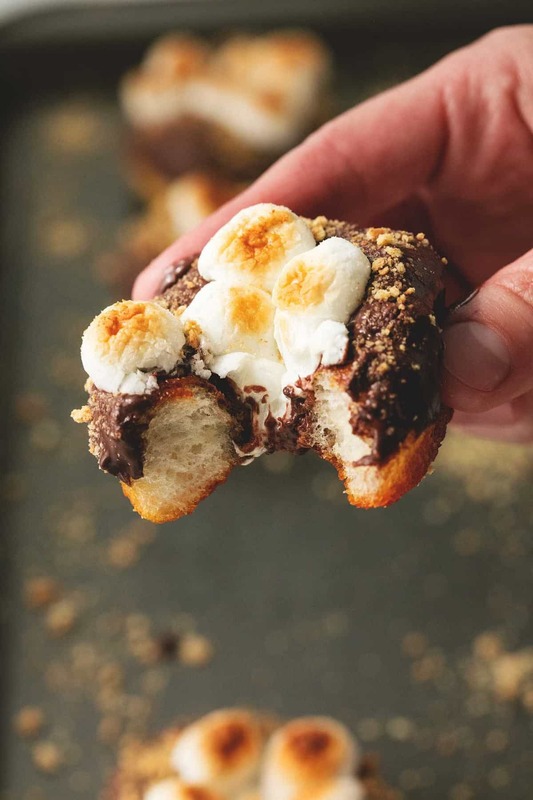 Easy s’mores donuts you can whip up in just 15 minutes with only five simple ingredients. These make the perfect summer dessert for s’mores lovers! I’m a bit of a movie buff, have I mentioned that? And I’ve got a real thing for Disney movies. I can quote most of them backwards and forwards, and I could do that even before I had kids. No shame here, Disney knows what’s up. So with hot shmoes in mind, let’s talk donuts. S’mores donuts to be exact. Crispy little fried pillows of airy donut goodness dipped in melty chocolate, then topped with toasted mini marshmallows and crushed graham crackers. 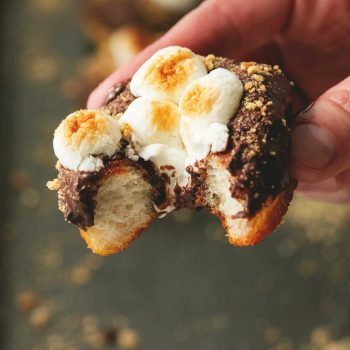 All the flavors of a s’more in a spectacular, easy to make, donut form. So basically mega s’mores. This is my kind of summer treat. And because I don’t love frying indoors (really how do you keep the kitchen from smelling for three days after? or your HAIR??) 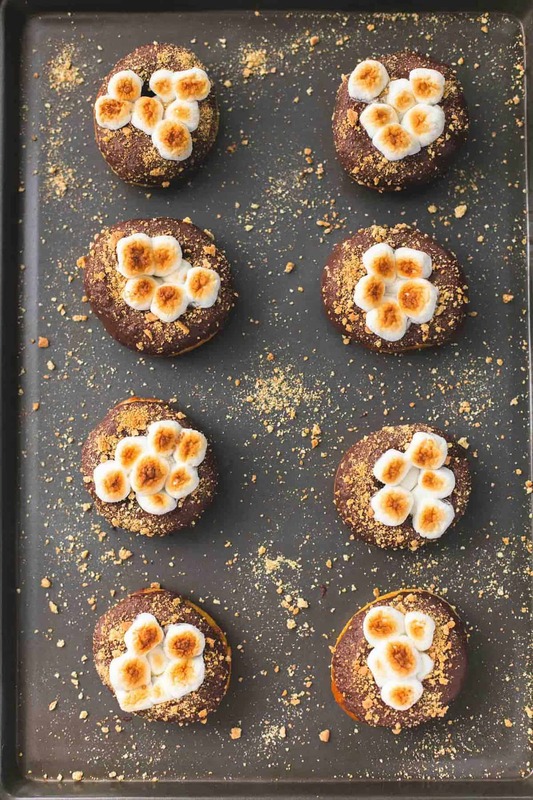 summertime really is the perfect time to enjoy these s’mores donuts because I just plug in a little portable burner on my back porch and fry them outside! Even if you do make these in the kitchen, you’re only spending about 4 minutes of time actually frying because they cook so quickly! So there’s really no mess to clean up and the whole lot of donuts will be ready in about 15 minutes. This recipe makes about 20 donuts so invite a few pals over, or see how you do at the Donut-Every-Hour Challenge. It’s a thing friends, it’s a real thing. 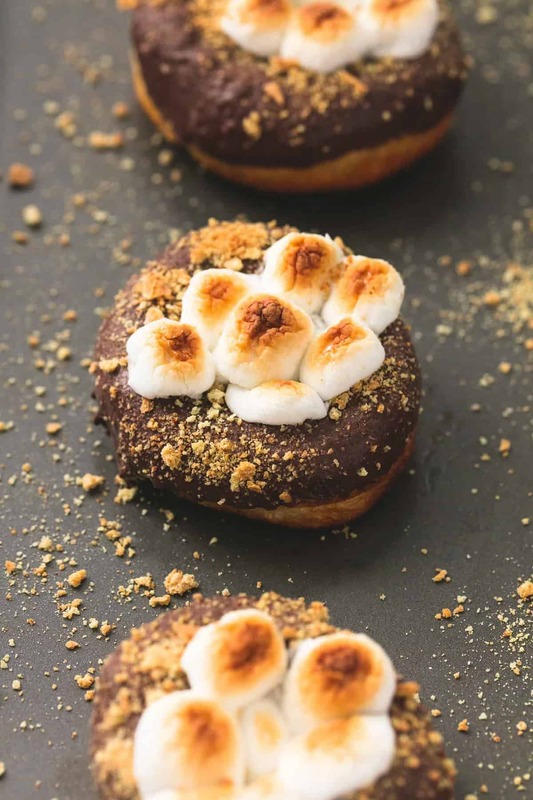 Easy s'mores donuts you can whip up in just 15 minutes with only five simple ingredients. These make the perfect summer dessert for s'mores lovers! Add enough oil to a large frying pan so that oil is about 1/2 inch deep. Heat for several minutes over high heat until very hot. Reduce to medium-high heat. While oil is heating, use a round 1-inch cookie cutter to cut the centers out of the biscuits to make donuts. Discard the donut "holes" (or you can fry them and dip in chocolate and graham crackers along with the regular-sized donuts). Use tongs to place donuts in the oil, cook for 1-2 minutes until bottoms are browned, then flip and cook another 1-2 minutes until completely golden. Transfer to a paper-towel lined plate or cooling rack and repeat with remaining donuts. While donuts are cooling, place chocolate in a microwave-safe bowl and microwave on half power for 1 minute, then 20 seconds more at a time, stirring after each until smooth. Dip donuts in the melted chocolate to cover one half of the donut. Top with marshmallows and sprinkle with crushed graham crackers. Serve immediately or allow to cool completely, then store on a plate covered in plastic wrap for up to 24 hours. Try these other Dessert Recipes you'll love! hey girl- these donuts look amazing! “To infinite, and beyond!” comes to mind when looking at these doughnuts. 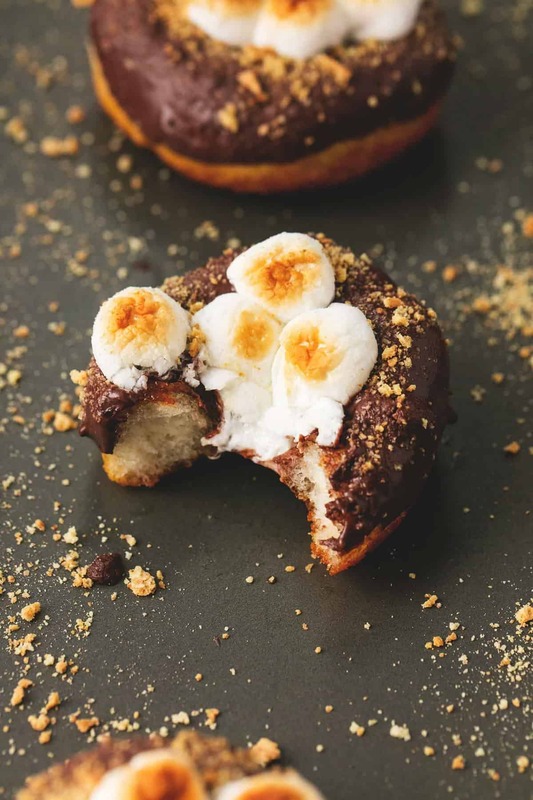 I mean, s’mores… in doughnut form 😍 And I agree, Disney (especially Pixar) rules! This looks and sounds absolutely delicious! And even better that it is so easy to make! It’s a long time from the last time we have had donuts, I guess it’s time for s’mores donuts this weekend. Thank you for sharing the recipe! It is really great thing for us.